I want to share my knowledge of cooking as I observed in my training of how Italians eat and enjoy their meals gathering all together around the table sharing daily life conversations. My approach to cooking is similar to my approach to life. Keep it simple, eat only fresh foods, and balance my diet with an emphasis on fresh, organic vegetables with protein coming mostly from wild caught fish. Although protein is necessary in anyone’s diet it does seem to me that fresh fruits and vegetables are equally important. I do not count calories, but I do believe in moderate eating habits and regular moderate exercise, just as Italians enjoy a nice walk after a meal. Italian cuisine is a well rounded diet regime, and being bordered on three sides by the sea, it has many interesting and tasty ways to prepare fish. Pasta is a staple in the Italian diet, but is rarely eaten as the sole dish in the meal. There are numerous varieties of pasta and the sauces to accompany it, but should only be a part of the meal. Small portions, fresh foods and simple preparation are my guide to good eating. In my restaurant, Trattoria Mollie in Santa Barbara, California, the diner will always find fresh and simple classic Italian cuisine. I have been a guest chef for Grand Hyatt Hotels two times in Hong Kong and once in Dubai, UAE. And in West Palm Beach, Florida at the 2007 Internal Polo Convention this May. In 2008 I have been invited as guest chef and cooking instructor on the cruise ship Silversea on the Mediterranean. I was born and raised in Mekele a small town in northern Ethiopia. Italian cultural influence is in evidence in most of my homeland because of the extended occupation and in migration of Italians. My father spoke Italian because he worked with them when he was young. 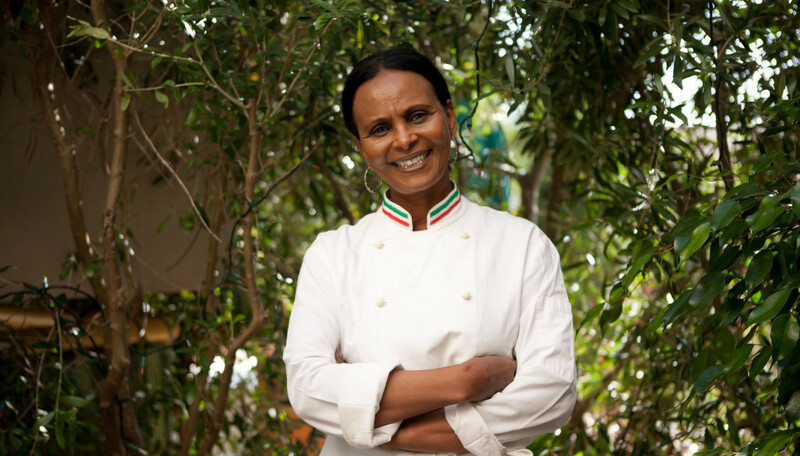 It isn’t all that unusual for an Ethiopian with an interest in things Italian to seek a career in Italian cuisine. I trained with the well known chef Gianfranco Vissani whose restaurant in Braschi has the highest rating in La Guide De l’Espresso the Italian Michelin style guide. In Roma I trained at Arturo’s restaurant on the Aurelia Antica, near the Vatican Colleges. My pasta education comes from my intensive training in Bologna with Chef Roberta, I also trained in Padova where I learned to prepare the Ciabatta bread that was first developed there over 100 years ago, and I bake fresh for my diners every day.